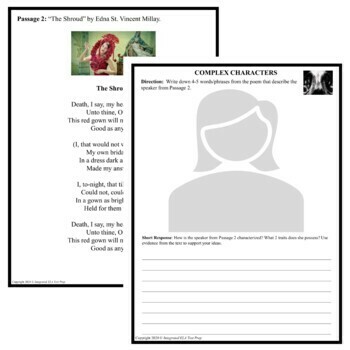 This Common Core ELA Test Prep Lesson Pack of PAIRED PASSAGES helps students prepare for Common Core-based state reading comprehension exams and assessments. It contains 5 DAYS of EASY-TO-TEACH Lessons with Activities and Test Questions/Answers based on the Common Core Standards. 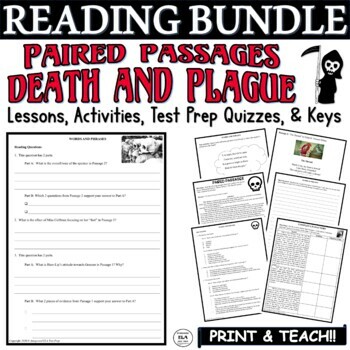 It includes a passage from Jack London's The Scarlet Plague (PUBLIC DOMAIN) and Edna St. Vincent Millay's poem "The Shroud" (PUBLIC DOMAIN) as well as Detailed Lesson(s), which would be great for whole group lessons, small group instruction, pull-outs, push-ins, rotations, or sub / substitute plans. The lessons could be used for 6th-10th graders with or without teacher guidance, depending on the amount of differentiation needed for each student. Each lesson takes about 45-120 minutes, depending on the goal for the lesson and choice of activities. Give yourself a breath of fresh air with this NO PREP curriculum that integrates test prep within the teaching of literature. ***These lessons are also part of my 5 Days of Lessons Bundles and Paired Passages Bundle in my store as well as the Common Core ELA Reading Test Prep MEGA BUNDLE 85 Days Lessons Quizzes Activities! *** PLEASE BE CAREFUL NOT TO PURCHASE TWICE. CHECK OUT MY BUNDLES FOR A GREAT DISCOUNT! 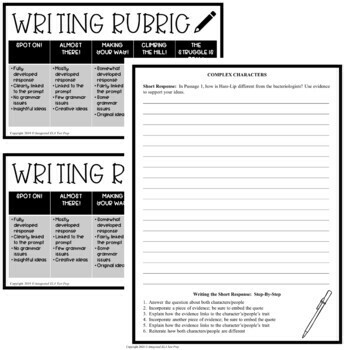 Strategies that could be used during or after reading (but are not a part of this pack) are SOAPSTone (Speaker, Occasion, Audience, Purpose, Subject, and Tone), SBAC (Scan, Brainstorm, Analyze, Confirm), SPAUTS (Speaker, Purpose, Audience, Universal Idea, Theme, Strategies), FSA (Firm Up Your Ideas, State Your Reasons, Assess the Truth), ACE (Answer, Cite, Explain), etc.